Lee Abbey Youth Camp has been running for 65 years on the camp field at Lee Abbey in North Devon. 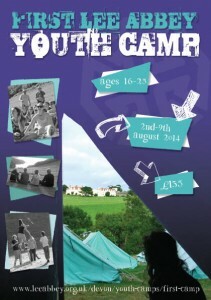 This year they will be running First Camp (16-25s) from 2 to 9 August, and it costs just £135 per person. where there’s space and time just to be you? where there are 5 meals a day and it’s nearly always tea-time? where the stars are bigger and the days are longer? where the young at heart treat you as an adult? where God’s love is not just discussed but also experienced? where you come as you are, but leave someone different? Interested? Try Lee Abbey First Camp, Devon. A team and community is waiting to welcome you, wherever you come from for a week of fun, friendship and faith.